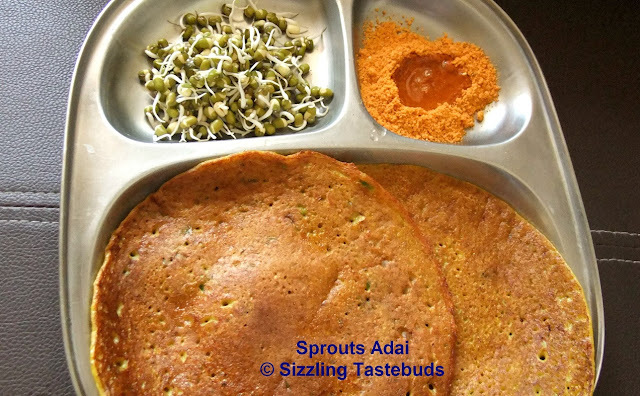 Sprouts Adai must be the healthiest breakfast option that is dished out at my place. A healthy twist to the usual Adai (lentil crepes), this is one sure shot way to get kiddo to munch on sprouts and is a very healthy breakfast for diabetics too. You can make it with normal soaked moong dal too, but I had some sprouts leftover after making Moongachi Usal. so made it with sprouts. Try it out, am sure you would love this. You may also use mixed sprouts, but as I had moong sprouts prepared it with the same. 1) Wash and soak the rice and dals separately for 4 hours. Add the red chillies to soak along with the dals. 2) Grind the rice first. Then add the dals, chillies, sprouts and grind to a smooth paste. 3) Add salt, curry leaves, hing,grated ginger, turmeric, jaggery and mix well. 6) Drizzle oil around the sides. Cook on both sides and serve with Molagapudi and any chutney. Thanks Kalyani, I love adai unfortunately nobody at home :(. great recipe would love to make these on a Sunday Breakfast! Nice way to use up leftover sprouts! Yummy breakfast! Healthy and yum..superb recipe Kalyani! healthy adai, adding sprouts makes more protein rich. Yum, I love crepes. I like your hint about using brown rice, too. Thanks for sending this to My Legume Love Affair. Wat a healthy n protein rich adais.. Healthy and nutritious adai. Looks delicious. loved this nutritious and yummy Adai...platter looks inviting!! Lovely adai, i love this with jaggery and butter. Yum! Very healthy adai kalyani. Hope your daughter is getting better. Thanks for linking it to the event. I have made pesarattu with sprouts and totally loved it. Adai looks yummy. Thx for linking to the event. Healthy adai. I always make mine with brown rice.. I love most of your recipes! This is one of them! Thanks for linking to my event!